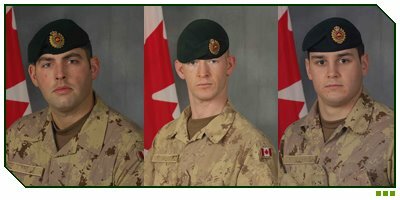 Three Canadian soldiers were killed and one seriously injured when an improvised explosive device detonated near their vehicle on August 20. Sergeant Shawn Eades, Corporal Dustin Roy Robert Joseph Wasden, and Sapper Stephan John Stock were combat engineers with 12 Field Squadron, 1 Combat Engineer Regiment. They were attached to the 2nd Battalion, Princess Patricia´s Canadian Light Infantry Battle Group. The injured soldier is in serious but stable condition. The four soldiers were on patrol on Highway 1, in Zharey District, when the explosion occurred at approximately 10:30 a.m., Kandahar time. They were evacuated to the Role 3 Multinational Medical Unit at Kandahar Air Field where three were pronounced dead. Three Polish soldiers were killed on Wednesday in a roadside blast in central Afghanistan, officials said. 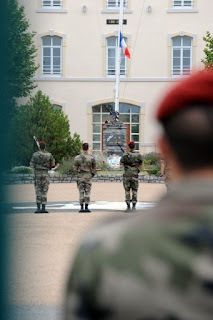 Soldiers stand to attention as the French flag is flown at half mast at the French 8th marine parachutist regiment headquarters on August 19 in Castres, southern France. French President Nicolas Sarkozy arrived in Kabul on Wednesday in a show of support for French troops after 10 were killed in the deadliest attack yet on international forces in Afghanistan.